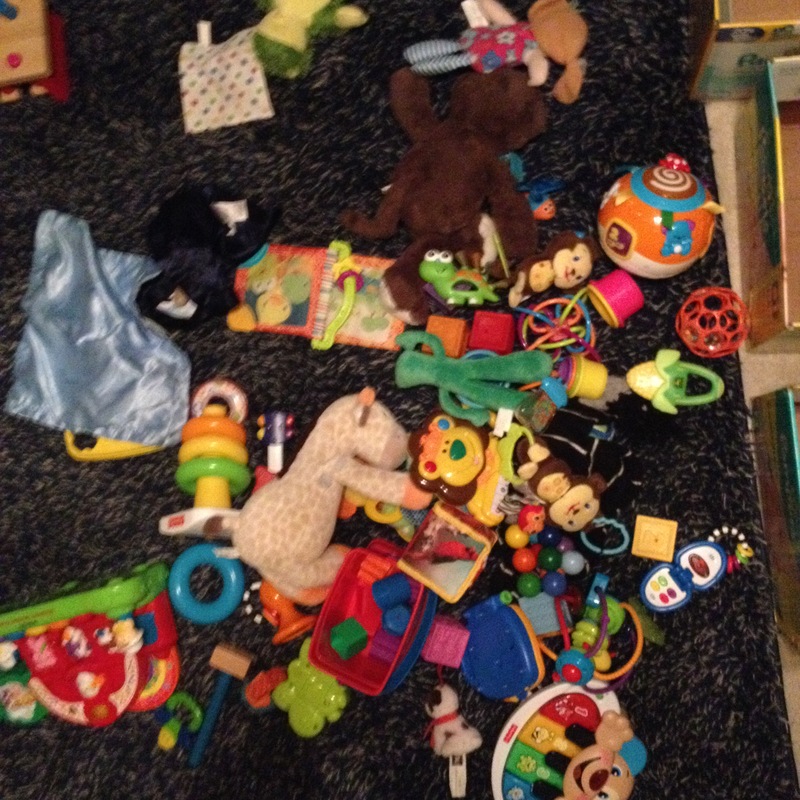 One of the best pieces of advice I received while pregnant was to not let my kids have access to all their toys at once. This helps keep their play space cleaner and it helps keep them interested in toys longer. If they only see a toy once a week it continues to feel new long after receiving it. We never really put this into practice but once I was staying home with the boys full time our house would get trashed quickly. With twins you accumulate a lot of toys. So, one night, when they were in bed I figured out just how to do this. My boys have a lot of similar type toys. You know the usual baby toy fare; rattles, stuffed animals, electronic things that sing, chew toys, etc. I separated everything into piles of likeness. I had 1 pile that was a miscellaneous pile, all the toys that were one of a kind. Next I went a rounded up some of our old diaper boxes. With twins you can imagine the hoard of boxes we have collected the last 10 months. I kept many specifically to help with storage of all the paraphernalia you collect having multiples. I used the old diaper boxes as the toy boxes. I took one toy from each pile and put it into a box. I did this until I had all 5 boxes filled. Each box ended up with a similar, yet different mix of toys. 1 electronic toy, a rattle, a stuffed animal, one developmental toy (like stacking rings), a chew toy, and sensory toy (different fabrics or textured things). In addition to that they have their walkers, a bouncer, a push walker, and an activity table they always have access to. At this point we only had 5 boxes but that may change as they accumulate more things. At this point it hasn’t impacted their play in any way and many toys that were ignored before now get played with. I also have an easier time cleaning up at the end of the day. I feel this also will teach them, as they get older, that you don’t always get access to things right away just because you want it. We’ll see though, it may backfire on me. I guess we’ll find out.